, or rather Paget (Eusebius), a Puritan divine, was born at Cranford in Northamptonshire, about 1542, and at the age of twelve years came to Oxford, where he was first choirister, and afterwards student of Christ Church. He made, according to Wood, a considerable progress in logic and philosophy, but, although a noted sophister, left the university without taking a degree. 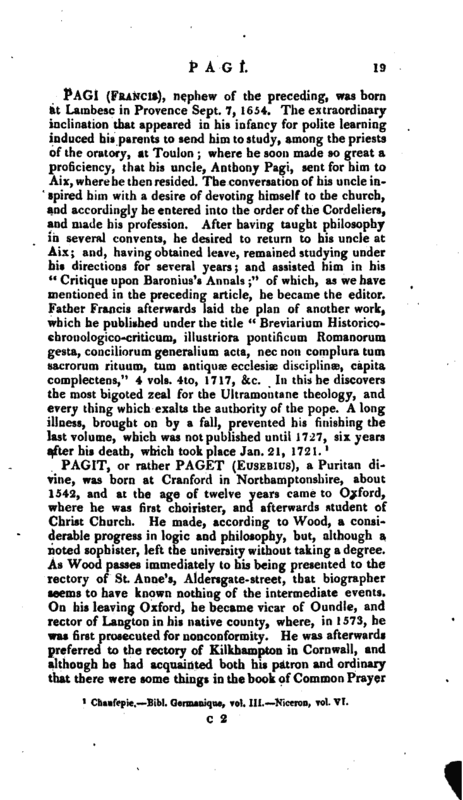 As Wood passes immediately to his being presented to the rectory of St. Anne’s, Aldersgate-street, that biographer seems to have known nothing of the intermediate events. On his leaving Oxford, he became vicar of Oundle, and rector of ‘Langton in his native county, where, in 1573, he was first prosecuted for nonconformity. He was afterwards preferred to the rectory of Kilkhampton in Cornwall, and although he had acquainted both his patron and ordinary that there were some things in the book of Common Prayer | with which he could not comply, and they had promised, that if he would accept the cure, he should not be molested on that account, yet a prosecution was commenced against him, which ended in his losing all his preferments, and even a school which he attempted to establish for his maintenance. 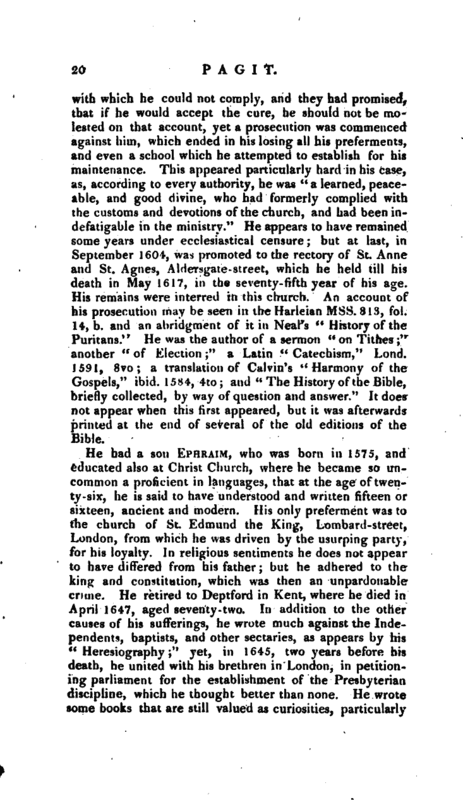 This appeared particularly hard in his case, as, according to every authority, he was “a learned, peaceable, and good divine, who had formerly complied with the customs and devotions of the church, and had been indefatigable in the ministry.” He appears to haye remained some years under ecclesiastical censure; but at last, in September 1604, was promoted to the rectory of St. Anne and St. Agnes, Aldersgate-street, which he held till his death in May 1617, in the seventy- fifth year of his age. His remains were interred in this church. An account of his prosecution may be seen in the Harleian Mss. 813, fol. 14, b. and an abridgment of it in Neal’s “History of the Puritans.” He was the author of a sermon “on Tithes” another “of Election” a Latin “Catechism,” Lond. 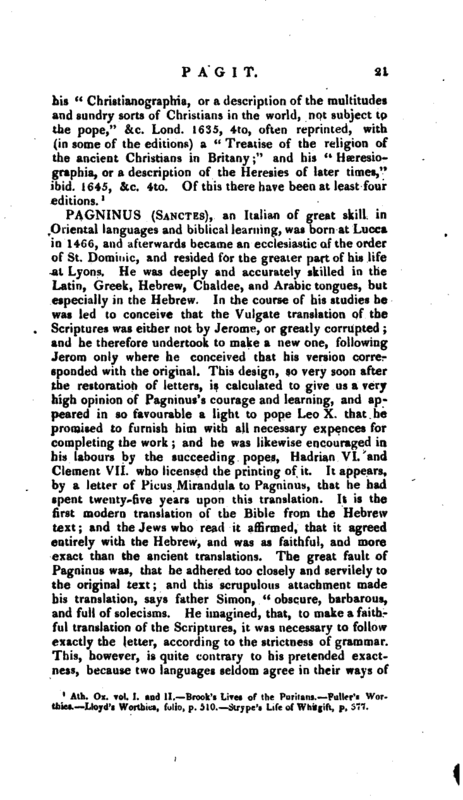 1591, 8vo a translation of Calvin’s “Harmony of the Gospels,” ibid. 1584, 4to; and “The History of the Bible, briefly collected, by way of question and answer.” It does not appear when this first appeared, but it was afterwards printed at the end of several of the old editions of the Bible. 1 Ath. Ox. vol. I. and II. Brook’s Lives of the Puritans. Fuller’s Wor< thies. Lloyd’s Worthies, folio, p. 510. —Strype’s Life of Whjtgift, p, 577.